It’s finally Momma Zip’s turn to share on the blog! I typically don’t read the blog until late evening when I’m checking Facebook and it happens to roll up on my feed. By this time, it is already live and has been read by hundreds of people. I have been surprised several times by the topic or by my name being mentioned. Sometimes I laugh, sometimes I cry happy tears, and sometimes I just roll my eyes. This time, it’s their turn to be surprised! The story I want to tell is not totally about Azzip but about a favor I asked of our home office staff. They embraced this favor and have far exceeded my expectations. 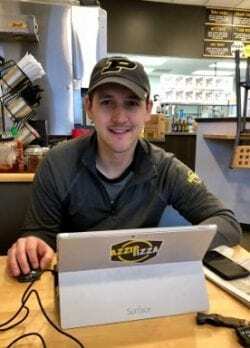 Four years ago, the first Azzip store opened on the west side of Evansville. Two years later we were able to move our office out of our home and into office space we rent in downtown Evansville on Martin Luther King Jr. Boulevard. 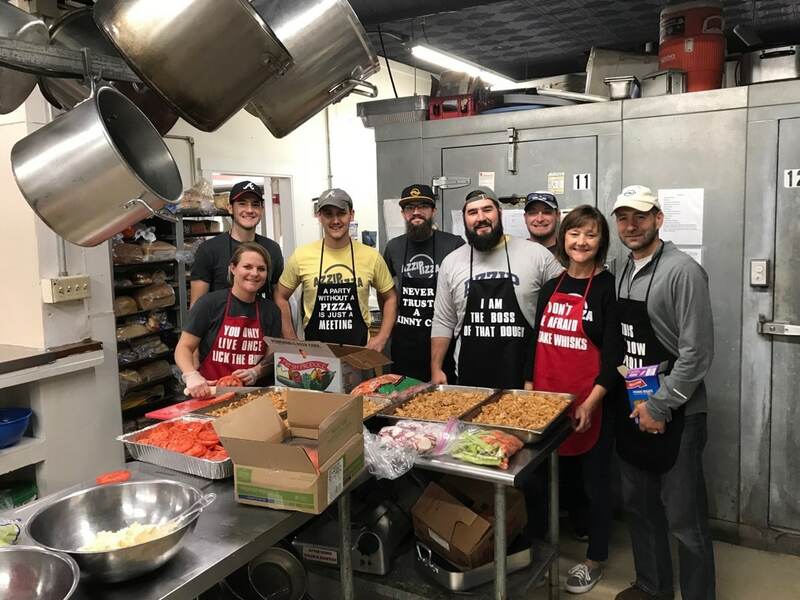 After a few months of walking into our building and noticing our neighbors across 6th street at the United Caring Shelter coming and going from the building, I asked our home office team if they would be willing to serve monthly meals. Of course, they could not tell their mom no. Thus began an unforgettable experience. 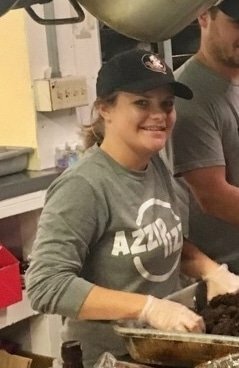 One of the things that has made Azzip successful is the diverse talents of our staff. As with Azzip, this crew never ceases to amaze me with their creativity at UCS. They are efficient (calling plate changes, calculating batch sizes). They are competitive (serving more meals than other teams, plating speed and precision). They market (writing #thirdthursdays on menus). 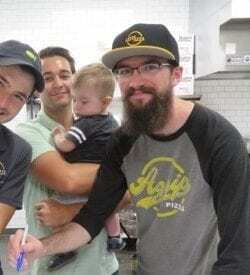 They provide customer service (always trying to accommodate special requests). They have fun with it! 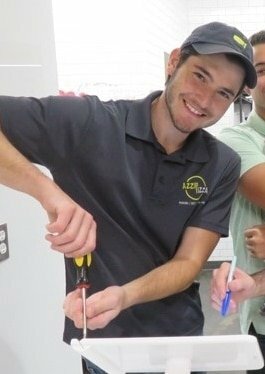 Two years into volunteering and everyone is always ready to go to fix a meal on the third Thursday! 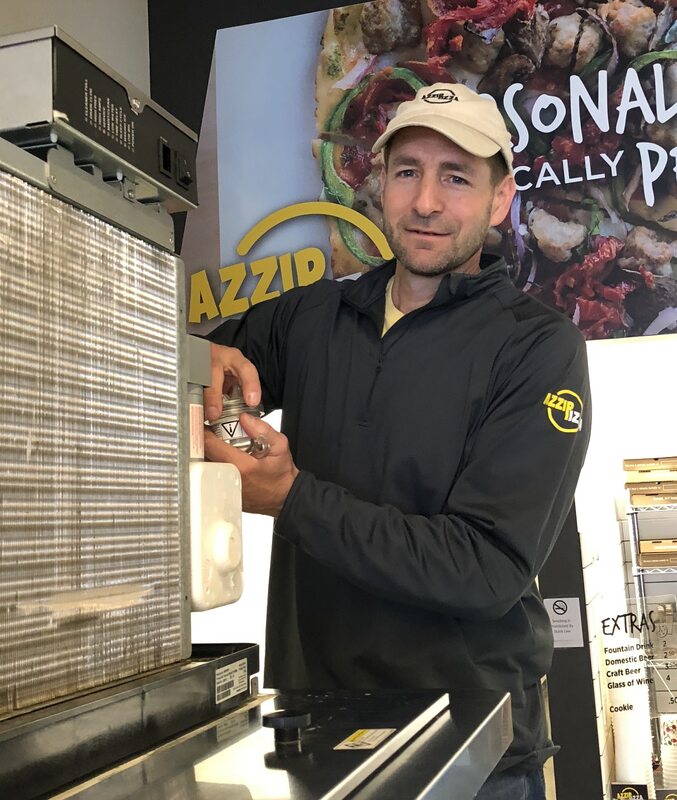 From a mother’s prospective, I am proud of the successful pizza restaurant business they’ve built and equally proud of their willingness to share their time and talent in the community. I also would like to take this time to give a shout out to United Caring Shelter and the good work they do. Phyllis, our dinner contact, is always helpful, responsive and keeps a clean shop. The front desk workers are always all smiles when we walk in and make sure the dinner guests are respectful. The dinner guests always make us feel like we just fed them the best meal they’ve ever eaten and do all of the clean-up. The two and a half hour, once a month experience has been a win on many levels. 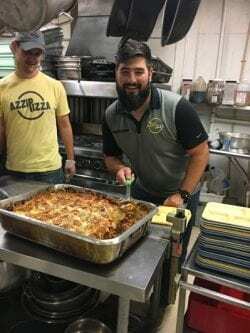 Truly a great team builder for our home office staff, Azzip gets to put to good use ingredients left over from our monthly pizza specials, we get personal interaction with our neighbors at United Caring Shelter and Blake gets to unleash his creativity with food on guests that truly appreciate it. We’ll let you know when his caring shelter cookbook comes out!